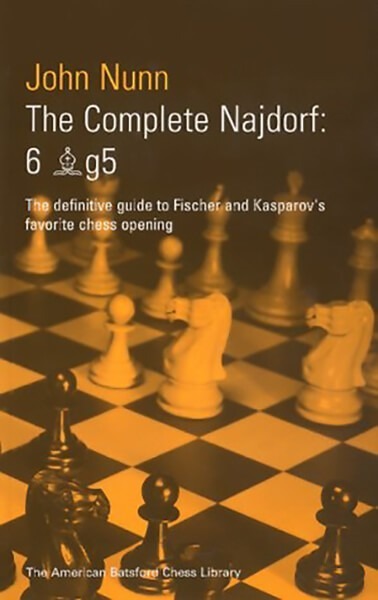 The Najdorf Sicilian (1.e4 c5 2.Nf3 d6 3.d4 cxd4 4.Nxd4 Nf6 5.Nc3 a6) is the most important, popular, and talked about opening in chess. Its name is synonymous with such luminaries as Tal, Fischer, and Kasparov.? As would be expected by the preceding three names, Black plays soundly for a win, with a full-scale battle developing with no scope for drawish simplifications. The Najdorf includes many famous variations that have practically made players' careers, such as the Poisoned Pawn, the Polugaevsky Variation, and the Gothenburg Variation, introduced disastrously as a team weapon by Argentine players against Soviet Grandmasters in 1955.? Kasparov has relied on the Najdorf in all of his World Championship matches. But not only World Championships hinge on the Najdorf, it has proven itself in millions of games as the ideal work-horse for club and tournament players. In this comprehensive book GM Nunn covers all of its variations in detail.? About the Author: John Nunn is a grandmaster from England. He has won four individual gold medals and three team silver medals at Chess Olympiads. In the Chess World Cup of 1988/9, he finished sixth overall, ahead of several former World Champions. He is arguably the most highly acclaimed chess writer in the world, with two of his books receiving the prestigious British Chess Federation Book of the Year Award.